Most accidents can be prevented with proper training, inspections and maintenance. Our goal is to educate crane operators, riggers, inspectors and businesses to reduce the risks inherent in any location where cranes are working. We want to improve the skills of those working in and around cranes, ensure that cranes have been properly inspected and maintained, help workers make rational decisions in a dangerous environment and assist businesses in creating safer worksites. 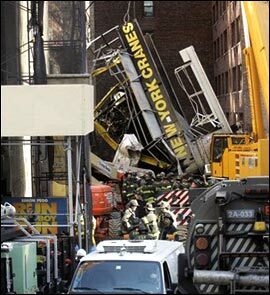 We are continually adding to our crane safety resources. You'll find articles, safety videos, stories of complicated lifts and solutions and a variety of accident videos and photos to enhance awareness of the necessity for crane safety training and eduction. Tom Barth, owner of Barth Crane Inspections, LLC has more than 38 years experience as a crane operator, trainer, inspector and accident investigator. He has operated cranes of all types in some of the harshest conditions in the world, investigated crane accidents in more than 55 high-profile cases and has prevented numerous potential accidents with his highly regarded and accredited inspections across the country.